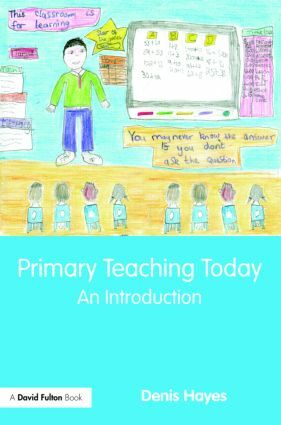 Primary Teaching Today takes the reader ‘behind the scenes’ and alerts them to the fundamental attitudes and practices that every new primary teacher must acquire to make a success of their work and, crucially, to get maximum enjoyment while doing so. With a friendly narrative style and refreshing candour, the book focuses as much on what primary teachers should aspire to be as it does on what teachers are meant to do. Thus, the early chapters orientate towards the attributes for which teachers should persevere; the later chapters are more heavily weighted towards the implications for classroom practice and work in school. The final chapter offers a variety of exercises and tasks to deepen thinking and enhance professional learning, linked to the QTS Standards. Throughout the book there are ‘Extend your thinking’ prompts containing statements and questions to stimulate the reader in facing challenging issues, a ‘Terminology check’ to clarify meanings of terms, plus ‘Strengthening practice’ boxes with practical suggestions about implementation. The book is also unusual in that it provides relevant information about key issues under ‘Professional learning perspectives’ at the end of each chapter.